To make your reservation at Jalama Beach or any other Santa Barbara County park, visit countyofsb.org. The interesting thing about San Luis Obispo and Santa Barbara counties is that there are so many county parks scattered across them with camping amenities. These parks make the perfect day or weekend trip if you're prepped for a sleepover adventure. After a couple of Google searches, I found Jalama Beach in Santa Barbara County. It's nicely tucked away on the coast between Lompoc and Gaviota, down the winding Jalama Road. It's a good hour-and-a-half to two-hour drive, depending on traffic. I decided to check out the park in early July. SOAKING UP SUMMER While the parking and camping sites were bustling with people, the actual beach had so much open space that it wasn't crowded at all. There's a $10 fee to enter, which I don't mind handing over because I know it contributes to preserving the space for people to enjoy. The county park has plenty of amenities that include camping sites, parking, showers, a general store, and a playground for kids on top of the beautiful beach. The story behind the beach is that it was once a Chumash Indian settlement named "Halama." In 1943, about 24 acres of the privately owned land was donated to Santa Barbara County, and the park was formed. 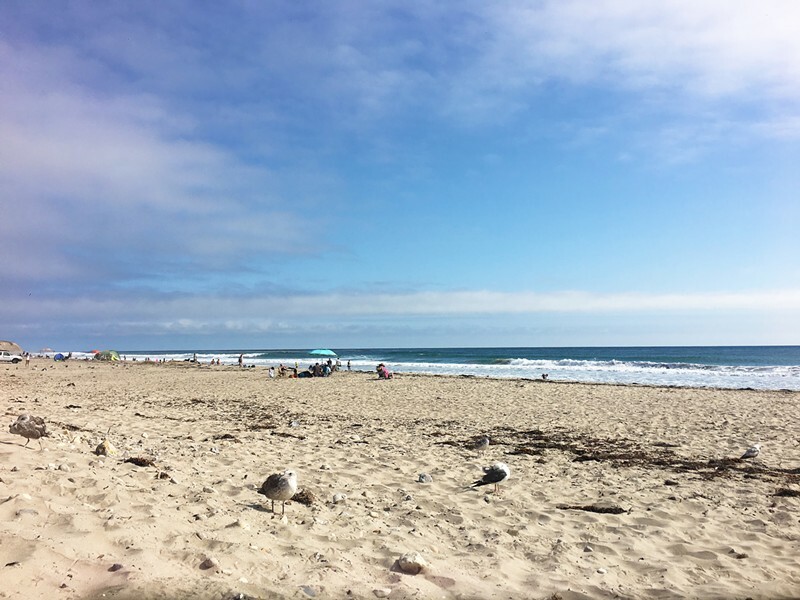 If you check out the Santa Barbara County Parks website, it states that Jalama Beach County Park is a respite from the typically bustling seaside parks. I respectfully disagree with that sentence in the best way possible. Upon entering the park, the parking lot is filled with people walking to their cars, drying off, shaking off the sand from toddlers' arms, and riding their beach cruiser bikes. That being said, there aren't a lot of parking spots for day-use visitors—I have to circle the area a number of times before I actually find a spot. After finally snagging a parking spot—thank you kind family of four for waving me down—I walk over to the general store. The beachfront café and camping supply store is jam-packed with everything needed to enjoy the campsite and beach, but I am there for the food. 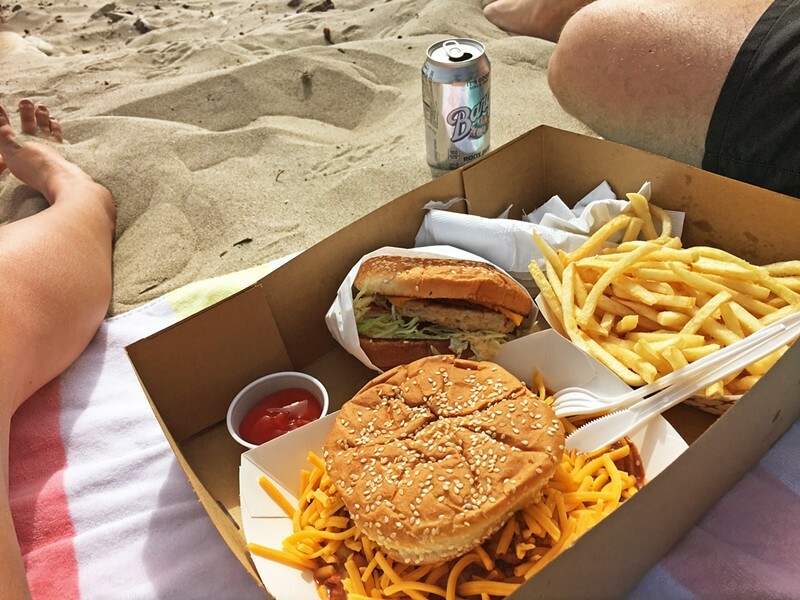 The Jalama Beach Store and Grill has been grilling up burgers and frying fish for about 39 years. BURGERS BY THE WATER The fact that Jalama Beach is known for its burgers is just another reason to visit the county park. There are sausage burritos, biscuits and gravy, and bacon sandwiches. There are burgers, hot pastrami sandwiches, and salmon burgers. I go for the turkey burger and a Jalama chiliburger. There aren't many places that make turkey burgers and make them well, at that. And on the café's Yelp page, many people have photos of themselves taking a bite out of the chili burger. While I wait for my number to be called, I sit down at a table inside the café and people-watch. You can tell there are many people who have been camping here for years and this is just a summer tradition. I overhear people telling their friends which burger to get or the best time to order food. Kids are running around in their bathing suits as cars move cautiously through the parking lot. Adults sit in their lawn chairs by their RVs shooting the breeze as the sun starts to dip. My number is finally called, and I grab the tray of burgers and fries to head to the beach. I can't really enjoy my burger if I'm not sitting next to the ocean right? While the park itself isn't so big, the beach is vast, which lends to multiple families spreading out and enjoying their time on the water.